Orange County and community leaders attended the Hispanic Business Initiative Fund’s (HBIF) 12th Annual Success Stories Luncheon on Sept. 14 in support of Hispanic entrepreneurs throughout Central Florida. The event is HBIF’s signature annual fundraising event and recognizes excellence in small business ownership and celebrates the spirit of entrepreneurship within the Hispanic community. The event, held at the Rosen Centre Hotel on International Drive, welcomed 500 attendees, including representatives from government and civic organizations and business leaders from across Central Florida. Chief of Staff to Orange County Mayor Teresa Jacobs Graciela Noriega Jacoby presented a proclamation to the chair of HBIF’s statewide board of directors Jan Aspuru and HBIF Statewide President and CEO Augusto Sanabria. The proclamation recognized Sept. 14, 2016, as HBIF’s 25th Anniversary Day in Orange County. Honorees included Hispanic entrepreneurs James Harhi, owner of JFH Technologies and Innovative Attraction Management; and Rubén Pérez, who owns Zaza New Cuban Diner. Both Harhi and Pérez successfully expanded their businesses with assistance from the HBIF, Florida’s leading Hispanic economic development organization. HBIF is a nonprofit economic development organization that serves Orange County’s Hispanic business owners by providing quality bilingual business development and training services. For 25 years, HBIF has provided thousands of Hispanic entrepreneurs with educational assistance, individual technical assistance, entrepreneurial grants for subcontracted services and loan facilitation. In recognition of this economic impact, the Board of County Commissioners allocated $125,941 to the Hispanic Business Initiative Fund in FY 2014-15 and $128,460 in FY 2015-16. From extraordinary culture, arts, academic achievement and leadership, Hispanic citizens and businesses have had an incredibly positive impact in Orange County. On Sept. 16, the Hispanic Heritage Committee of Greater Orange County (HHCGOC) will host its annual Hispanic Heritage Month Kick-Off at the Orange County Regional History Center. The event will feature musical performances, delicious food and an exhibition highlighting the works of talented local Hispanic artists. The HHCGOC is a volunteer-based organization founded in 1999 with the purpose of providing opportunities that promote and highlight the contributions made by individuals of Hispanic descent in the community. Thirty percent of Orange County’s population is of Hispanic descent. Orange County will wrap up its Hispanic Heritage festivities with Orange Fiesta in the Park on Oct. 15 at Jay Blanchard Park, 2451 N. Dean Rd., from 11 a.m. to 3 p.m. Guests will be able to enjoy several food trucks, musical performances, children’s activities, diverse exhibitors and the Mayor’s Cup Soccer Tournament Championships. 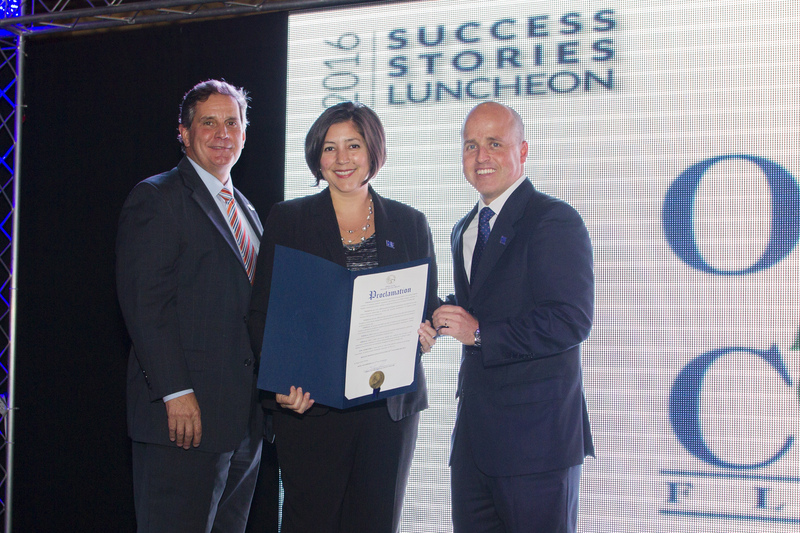 To view photos from the Success Stories Luncheon, visit Mayor Jacobs’ Flickr album.